The iPhone is already a very capable mobile camera capable of capturing amazing video. With the Movo Smartphone Video Kit, you can do even more with it. 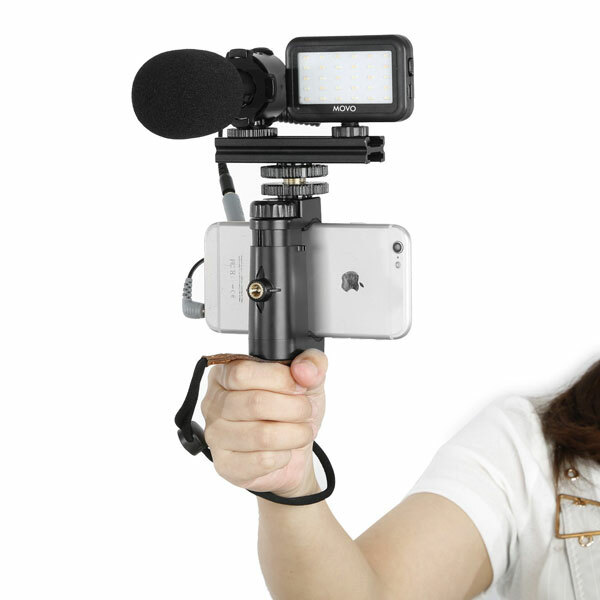 This kit comes with the PR-1 smartphone rig that accommodates smartphones 2.2″ to 3.6″ wide. You also get a stereo mic, LED light, and Bluetooth remote to interact with your phone. The light comes with 3 brightness levels and rechargeable battery. The remote is compatible with iOS and Android devices. This smartphone rig should be able to handle the iPhone X and other similar size smartphones.